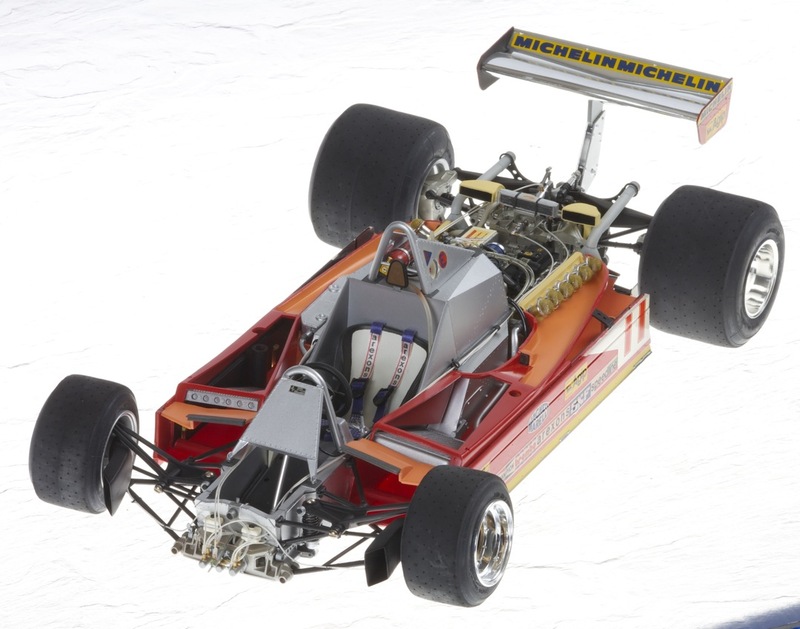 This model built in 1995/6 represents that driven by Jody Scheckter in 1979 to win the Drivers’ Championship with three victories. 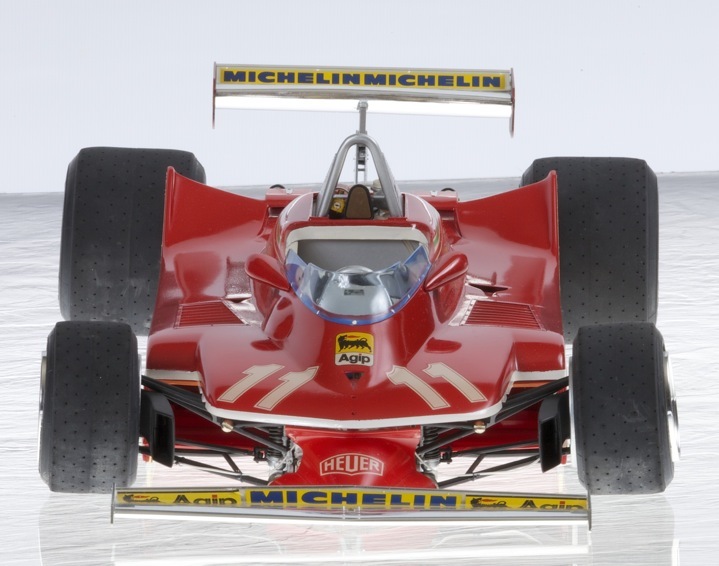 The second car driven by Canadian Gilles Villeneuve won a further three Grands Prix and Ferrari won the Constructors’ title as a result. 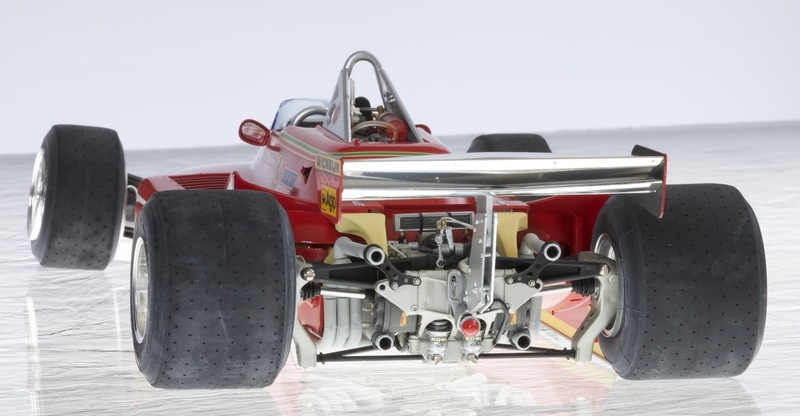 Following on from the 1978 demonstration of ideal ground-effects to date in the Lotus 79, the Ferrari was basically unsuited to this coming aerodynamic technology. 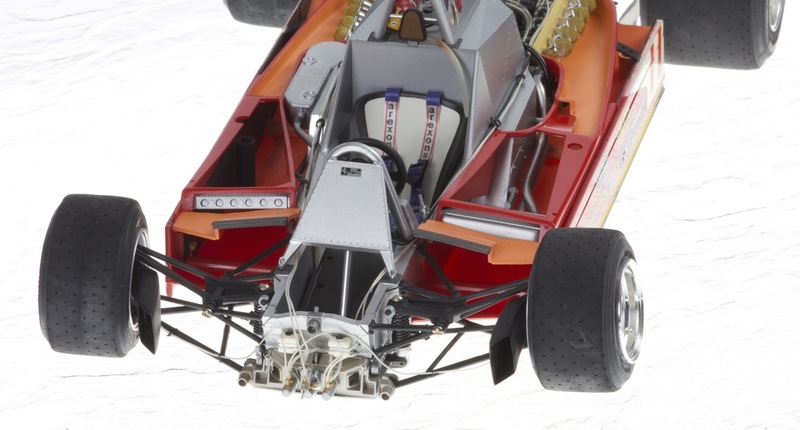 This was because it would be difficult to optimise undercar airflow around a wide flat-12 engine which necessarily projected sideways into the rear venturi. 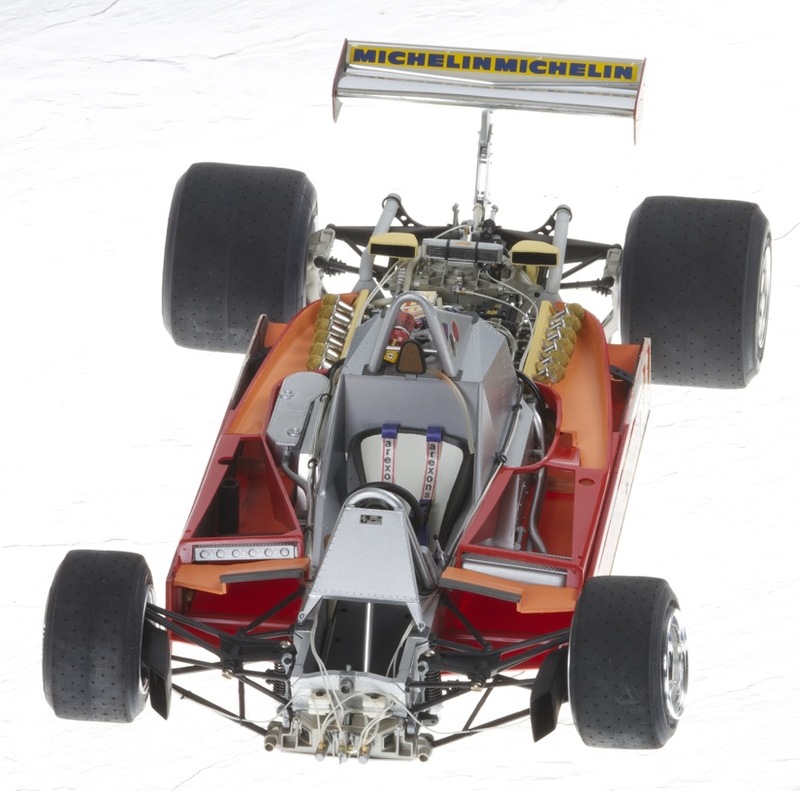 However, following on from 1978 success with new tyres (Michelin) in their 312T3 car, the T4 maximized the excellently powerful engine, the very efficient transverse gearbox, really tightly packaged rear suspension components out of the venturi airflow, a good sliding skirt system and then concentrated on tidying up the top surface of the bodywork to minimize disruption of airflow to the rear wing. 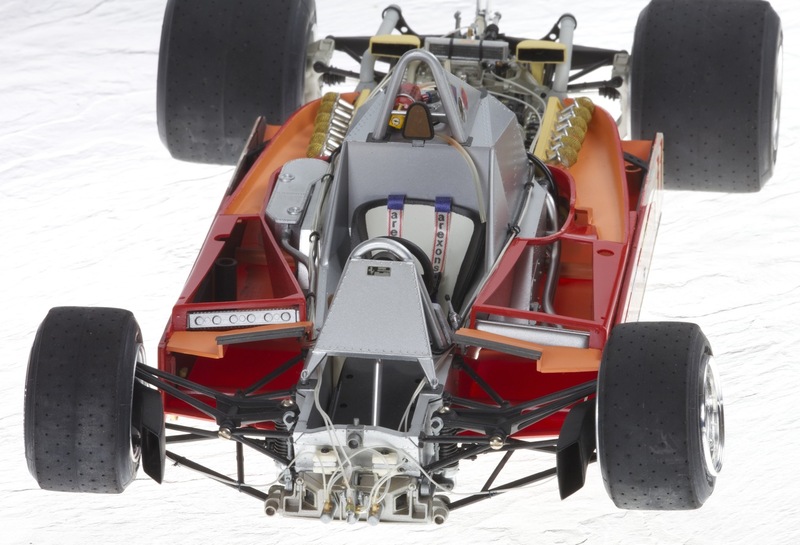 The end result was a package that ticked most of the boxes whilst other teams were yet to perfect ground-effect and so steal a march on others who would quickly overtake Ferrari in aerodynamic terms in 1980 onwards whilst Ferrari retained their flat-12 engine, unsuitable for ground-effect. 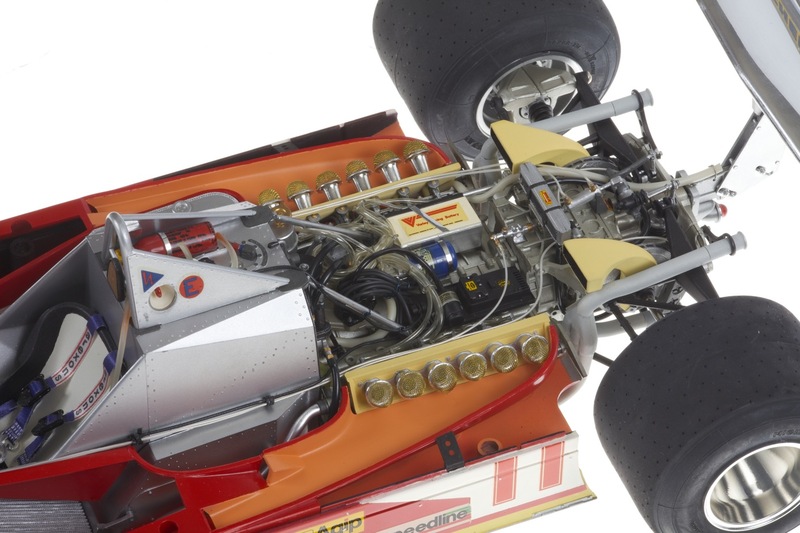 Reliability, consistency and a powerful engine masked some of the 312T4’s shortcomings to enable a very focussed and the mature driving approach of South African Jody Scheckter, to pluck the title from his rivals. This is a model I really enjoyed making, a beautiful Ferrari in my opinion. 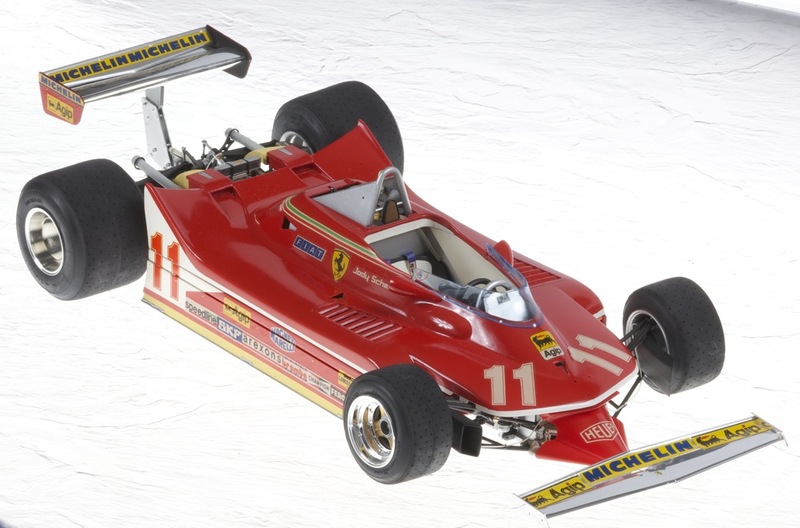 I know not everyone would agree and we have to understand why such a design could be as successful as it was for one year only, Jody Scheckter taking his one and only chance towards the end of his career and making an excellent job of it. This was my second T4, the original (mostly in the spares box, to this day) was hand painted by brush using Humbrol enamels in 1981 when I was spending a year-out after school before taking up my place at Edinburgh University to study veterinary medicine. 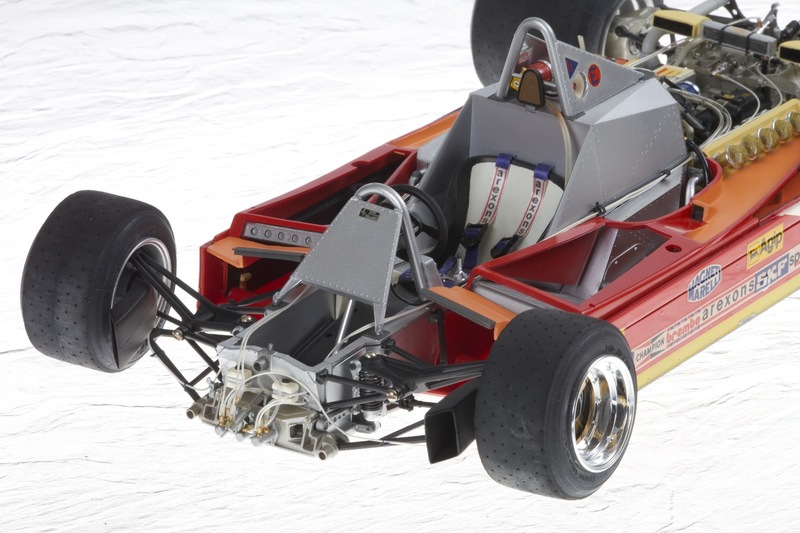 Back then, I had some money whilst I worked at Shell Research and bought the T4, a Yardley McLaren M23, my first Brabham BT44B (later to donate spares to form the Hesketh 308) and my second Lotus 72D. These having been built, were proudly displayed in the bedroom where I had digs and formed a significant part of a display in a cabinet when in the first years after graduation working as a newly qualified vet (1988-89). 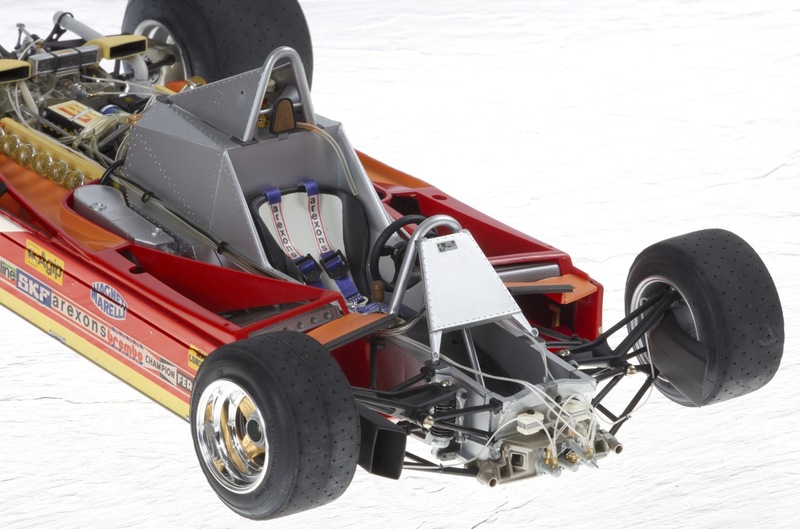 So, the 312T4 seen here was the subject of a very careful build having been further inspired by the majestically impressive work of Andy Mathews (USA) and his T4 proudly reviewed in a magazine I had access to- a real gem of a model. 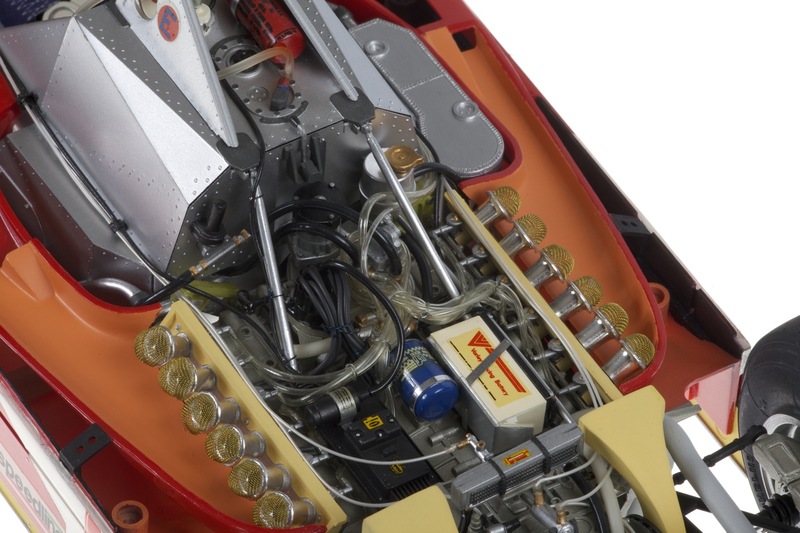 I wanted to emulate that model and knew I couldn’t because Andy discards many parts and has them remade in appropriate materials, often metal. 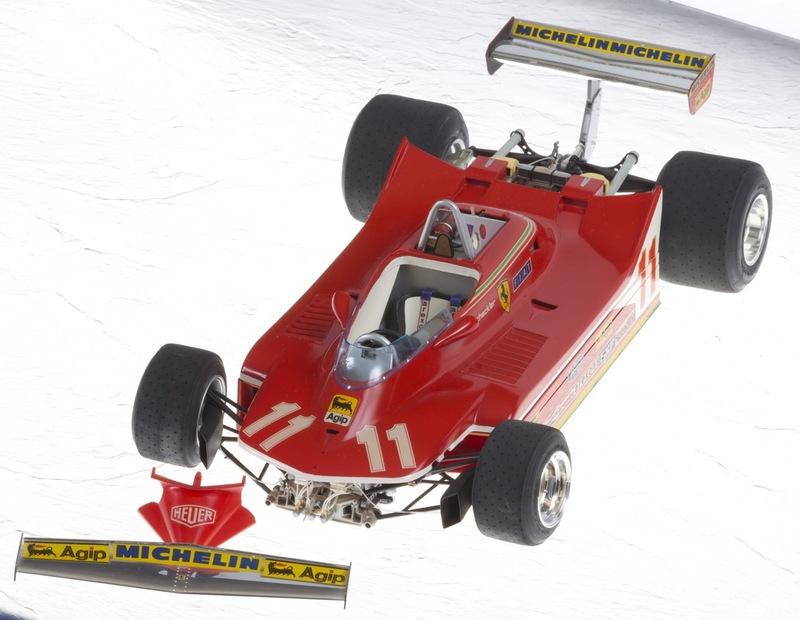 Nonetheless, I was going to make my 312T4 look like Andy’s as far as I could and he has become my inspiration since that time. (Incidentally, does anyone know how Andy is and if he is still producing models, for he appears un-contactable and his website is static as far as I can tell). Having chatted with Andy on the telephone in the late 90’s on several occasions, also having been the recipient of his kindness in correspondence, I wish him the very best and would very much like to re-establish contact. From then, the determination to produce the best and aspire to perhaps the best model maker in the world (Andy Mathews) was becoming central in my approach. Therefore, I used an airbrush for all but the smallest parts, super-detailed everything I could and made a detailed and high quality photographic record (print film and negatives unfortunately back in 1995). Apart from the insufficient depth of Humbrol enamel paint on the bodywork, I am very pleased with the result and having a second set of decals, have always wanted to strip the bodywork, re-spray with Automotive paints and produce an even better external appearance. 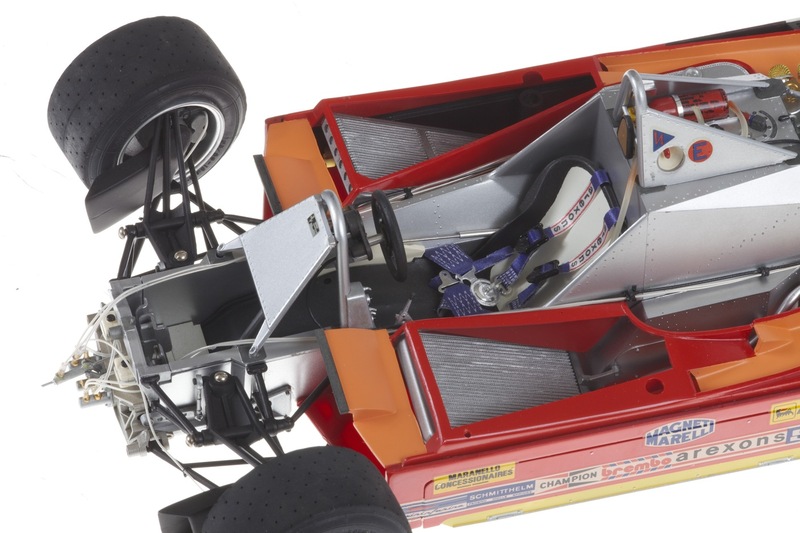 The T4 has always remained one of my favourite cars ever since I laid eyes on the Tamiya box which was a jump ahead of that which proceded it. The box contents and the instruction manual were a real joy to me and made a lasting impression. 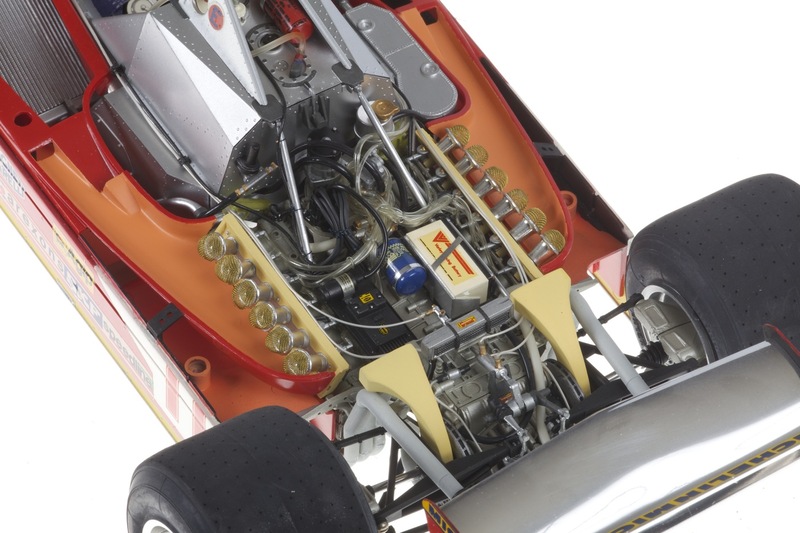 From studying it, one could begin to feel how a Grand Prix car was made and engineered. At this time, I had never seen one of course and the only F1 cars I had seen were those entered for the 1975 Race of Champions at Brands Hatch and those which attended the summer tyre tests at Brands Hatch in 1980, Ferrari being absent (but then it would have been 312T5’s which weren’t so good looking or successful). 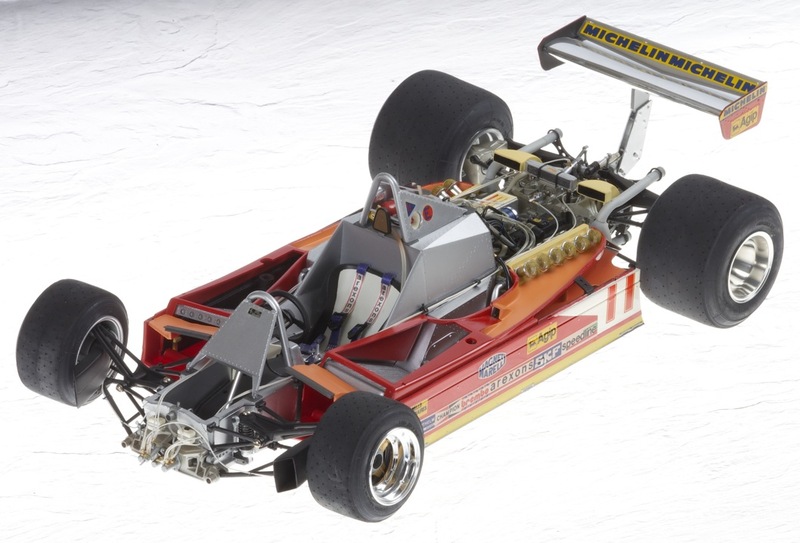 In later years, getting to know Jody Scheckter and working for him in restoring his own model collection (free of charge, the honour was enough!) was a real privilege. He expressed such kindness to me and bothered to invite my young sons (about nine years old then) to view his race cars and even lifted each of them into his Championship winning 312T4, whilst I took the part of a member of the paparazzi. 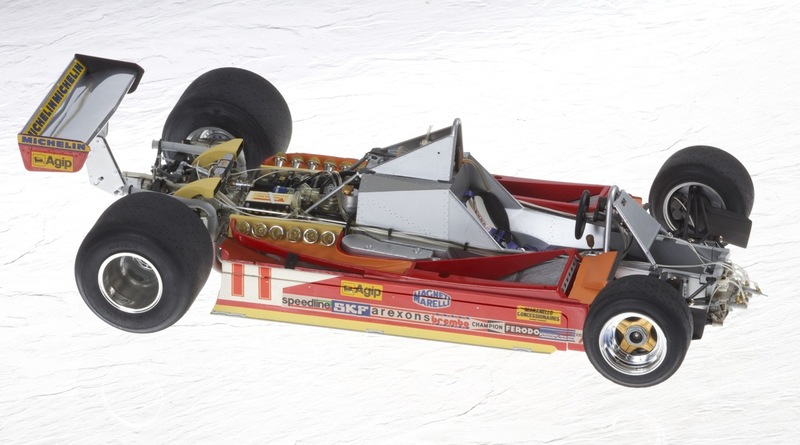 So the T4 has a special place in my life, yet the Lotus 72D and McLaren M23 remain my all time favourite race cars.